(Story from Martyrs Mirror, pp. 686-687). This Conrad Koch was kindled with the light of the knowledge of God, when this light, in these latter days, began to rise again, along the River Rhine as well as in the country of Berg, and the truth of the holy Gospel commenced to shine. Hence he sought, by the divine help, to leave the darkness, and to walk in this brightly shining light; he forsook popery and the worldly and ungodly life, and betook himself to the church of the Lord, heard and laid to heart the Word of the Lord, believed the Gospel, and was baptized, according to the command of Christ, upon faith in Christ Jesus, and confession of his sins, and accordingly, conducted himself in a brotherly and Christian manner in the church, and, in weakness, showed himself edifying and honorable toward all men. But as he that walks in darkness cannot bear or endure the light, and the envy of the adversary works in his followers, this man was envied by the papists, and accused to the intendant of the revenue; who was judge and ruler of the country in the name of the prince of Juelich. Thereupon the intendant sent his servants to Houf, where Conrad lived, and they apprehended him; he was ready, and as a lamb, willingly went with them to Loewenburg, one of the seven castles which, on account of their high situation, can be seen from a great distance. There they brought Conrad into the tower, and placed him in severe confinement, in which he remained nearly half a year; however, he was greatly comforted by the Lord, though he had to suffer much hunger. The intendant ofttimes browbeat him and threatened him most severely, that his life should be taken if he should refuse to renounce his faith. They tried him very hard with entreaties and solicitations, then with hunger, and also with threats to put him to death; but he remained immovable. His heart was of good cheer. Now when he had boldly confessed his faith, and no tortures could intimidate him, and the time drew near that he was to die for the truth and depart from this world, the door of his prison was opened, and he went of his own accord, free and unfettered, from the tower of Loewenburg to the village of Houf. His guide was Barabbas, that is a malefactor who went with him. His departure took place in great secrecy; and thus he came to Houf, which is some distance from Loewenburg. But even as Christ was crucified, and Barabbas released, so it was also here. Conrad was taken to the town hall of Houf, where it was proposed to him, that if he should renounce his faith, his young life should be spared, and his liberty be given him. Manifold wiles were employed against him with great deceitfulness. The sophists sang things sweet and sour, saying: “Go to church at least once a year and if they do not preach the pure and clear truth, stay away from it thenceforth.” One of these hypocrites said to Conrad: “My dear Conrad, though we be false, subtle and evil, it cannot harm your soul; do you only fear God and keep peace with all men; what is it to you if our faith is little.” Conrad replied to the magistrates: “O you ministers of God, you must know that God wants no hypocrites. This was seen exemplified in old Eleazar, who would rather surrender his life than dissemble. II Macc. 6:24. Therefore I also hope to die before I go into your congregation.” Conrad further said: “Christ is the Head of the church; he that would please Him must show himself a member of His body; now, one must not sever himself from Christ the Captain. With this Head I want to remain, though it cost my flesh and blood.” They asked Conrad of what he thought of infant baptism. He said: “Of this I can only think that it is also one of the pope’s greatest abominations; however if you can prove it by the Word of God, I will suffer myself to be instructed by the church of the Lord.” “O God,” said Conrad, “to Thee I bring my complaint; O God, what calamity this, that they put to death those who speak the truth! They can certainly not allege that I have committed anything criminal, and yet they malignantly seek to kill me. O Lord, forgive them.” The mandate of the prince of Juelich was then read to him, whereupon the judges passed sentence, upon which the intendant broke the staff. The sentence was, that Conrad should suffer death, if he did not recant. And when he had been thus sentenced twice, they took him out [to the place of execution]. When he arrived there, he began to sing: “O God, how gently Thou dost chasten me. Reach me Thy gracious hand, that my flesh may now shun all sin, vice and shame, that I may rend the old garment, and have eternal joy with Thee. Christ, I praise Thee, O my supreme God, that I have lived to see this day and hour, that I may now testify to Thy name with my blood. My dear brethren and sisters, I commend you all to the Lord. Keep the Gospel of Christ firmly fixed in your hearts; this I leave you for an admonition: fear God, and be valiant; be my followers, even as I am willing to follow Christ the Lord, and to deliver up my life.” And thus they put this pious man to death with the sword secretly, so that many did not hear of it. When thieves and murderers are condemned there it is customary to let the whole land know it; but the pious are murdered in secrecy, which is a shame for the judges. Thus Conrad was beheaded with the sword standing and proved himself a faithful witness of the sufferings of Christ, at Houf, in the land of Berg, which belongs to the prince of Juelich and Cleves. In the year 1565, under the same intendant, who was a very bloodthirsty man, also seven other persons, four brethren and three sisters, had been previously apprehended. These four brethren were also sentenced that they should be put to death, if they refused to renounce their faith. But the Lord protected them, and delivered them all out of prison unharmed in their faith, for this bloodthirsty tyrant was smitten by God with sudden death, so that the prisoners were liberated from prison, keeping their faith, and adhering to the truth. It is stated that at this time, as the heathen at Augustodonum, now called Autum, in Burgundy, on a feast-day of the goddess Cybele, whom they called the mother of the gods, carried around her image on a wagon, in procession, a certain pious Christian, called Symphorianus, met this image, and refused to worship it; in consequence of which he was apprehended as an impious person, or despiser of the gods, and brought before Heraclius, the Proconsul, who, in that city, exercised the strictest vigilance over the Christians. When he stood before the judgment seat, the Proconsul asked him for his name. Symphorian replied that he was a Christian by religion, was born of Christian parents, and had received the name Symphorian. Symphorian, having been thus strengthened by his mother, was taken out of the city, and beheaded there, having commended his soul into the hands of God, in the time of Emperor Aurelian, and Heraclius, the Proconsul, at Autum in Burgundy. His dead body was buried by certain Christians. In the ancient records of the pious witnesses of Jesus Christ, an account is given of Marinus, a citizen of Jerusalem, of noble descent, who, although he belonged to the nobility, entertained a sincere affection for the true Christians, who at that time were oppressed beyond measure. On this account his enviers, who were jealous of the honor of his nobility, severely accused and charged him with being a Christian; which he also confessed, when he was brought before the Judge; yea, he declared with a loud and clear voice, that he was certainly a Christian. The Judge then gave him three hours’ respite to consider, whether he would die as a Christian, or whether he would sacrifice to the gods and the Emperor. As he went away from the tribunal, Theotecnes, the bishop of the church in that city, took him by the hand, and led him to the meeting, in the meeting-place, strengthened him with many words in the faith, and, placing before him the sword which he was wont to carry at his side, and also the Gospel [book], he asked him which of the two he would choose? Marinus accordingly returned to the tribunal, and was forthwith called by the lord’s servant, for the appointed time had come; he did not delay or wait until he was asked, but said of his own accord: that he had considered the matter, and that it was established by the law of the fathers, that God must be obeyed rather than men. Eusebius Pamphilius [an ancient church historian] writes, that when Marinus had answered thus, the Judge immediately gave sentence that he should be beheaded. First, Adriaenken Jans’ daughter was suddenly apprehended. She resided at Molenaersgraef, in the Papendrecht district; which was under the jurisdiction of the city of Dortrecht, and because she was said to be a heretic, she was seized and imprisoned in the Vuylpoort. After that the plan was formed to capture Jan Wouterss van Kuyck, who resided in the city, but frequently changed his abode, so as not to be so easily recognized. To this end, the bailiff, having learned where he resided (namely, in the street leading to the Rietdijck, near the New Gate, in a room which was reached from the street by a flight of stairs), came with his beadles and unexpectedly, and without asking anything, ascended the stairs, where Jan Wouterss met him just as he opened the door. The bailiff said, since he did not know him: “Does Jan van Kuyck reside here?” to which this good, upright and very sincere man, not willing to speak contrary to the truth, answered yes, adding that it was he himself. These words he spoke very loudly, in order that his dear wife, who was back in the room, should hear it and flee, which she did: his only daughter, however, a child of only about seven years, remained in the room and saw her father apprehended, to which no attention was paid. The ministers of justice immediately laid their hands upon this friend of God, and forcibly bound him, whereupon he said: “O my lords, how you bind me, as though I were a wicked man; however, you bind not me, but yourselves.” Then a great lamentation arose among them; however, they proceeded, and led him, as a defenseless lamb that is overcome by wolves, from the Rietdijck to the Vuylpoort, about half an hour’s walk through the city, where they put him into another cell than the one in which Adriaenken Jans was confined, though within the same walls and under the same roof of said prison. In the meantime both had to suffer much temptation, according to the body as well as in regard to the soul; several times they were severely tortured, stripped, and scourged, so that almost the entire city spoke about their sufferings and misery, as Jan Wouterss subsequently also indicated in one of his letters. The [Roman Catholic] clergy also assailed them much according to the soul, in order to deprive them, by many wiles and snares, of the treasure of a true faith; but they were not able to accomplish anything with either of them; hence they [the two martyrs], were finally sentenced to death in open court, to be executed with fire, on the water front of the city, near a certain lime kiln, where now the new fortification is, between the mill that stands upon the bastion, and the rampart; however, with the condition, that Adriaenken Jans should not really die by fire, but should prior to her burning be strangled at the stake, which lesser penalty of death we do not find to have been executed on Jan Wouterss. In the meantime both prepared themselves for death with great desire and inward joy, unable sufficiently to praise God that they had been counted worthy to deliver up their bodies as a sacrifice for His holy name’s sake. When the hour of their departure had come, both were tied together; however, they fell upon their knees, and quietly offered up, before they were led forth, an earnest prayer to God the Lord, that He would strengthen them in their impending suffering, to persevere unto the end. Thereupon Jan Wouterss instantly pulled open his jacket and showed him his breast bloody from the scourging inflicted upon him in prison and said: “I already bear in my body the marks of the Lord Jesus;” and he lifted up his eyes to heaven, looking longingly as it were to the heavenly resting place. In the meanwhile, before all this was properly noticed, because of the surging crowd, said person went out of sight and disappeared among the people; whereupon some of the servants of justice murmured and sternly asked, where this man was. This occurred near the swine market, close by the New Haven. They went on and soon arrived at the place of execution, where two stakes stood erected near, and around which an innumerable multitude was gathered. Having arrived there, they ascended the height, or erected scaffold, where they on their knees again quietly prayed to God, though Jan Wouterss only was able to speak, since the mouth of Adriaenken Jans was well gagged with the previously mentioned piece of wood, or instrument. When they had risen, preparations were first made to strangle Adriaenken Jans, whereupon she placed herself at the stake. Then fire was set to the wood piled around him, and this friend of God was burned alive, as it appears, with his dead sister, to the great sorrow of many that stood around and were filled with commiseration at the sight of it. This was the end of these two dear favorites of the Lord, of whom no one spake any evil (touching their life), but whom every one praised on account of their virtuous walk. The bailiff also asked Joachim whether he was baptized. He replied: “I hold to one baptism, one faith, one Lord, and God.” Eph. 4:5, 6. Thereupon Joachim said: “Fear not them that kill the body; for hereafter, when they mourn, we shall rejoice.” Luke 6:23. Joris said: “Lord Thou knowest that I have sought Thee and my salvation; and for this cause I must now die. Therefore, O Lord, receive me graciously.” He further said: “Citizens of Antwerp, fear not; though we die for the truth, Christ our Lord went before us, and we must follow Him.” They then began to sing this farewell hymn: “Farewell, brethren and sisters all,” etc. Thereupon they commended their spirits into the hands of God, and ended their lives in the fire. They now lie under the altar, and wait to be clothed with white linen raiment, and to shine forth as the sun in the kingdom of the Father, where they shall be served with new wine and heavenly bread. Rev. 6:9; 19:8; Matt. 13:43; 26:28; Rev. 2:17. In the year 1569 a pious, faithful brother and follower of Jesus Christ, named Dirk Willems, was apprehended at Asperen, in Holland, and had to endure severe tyranny from the papists (Roman Catholics.) But as he had founded his faith not upon the drifting sand of human commandments, but upon the firm foundation stone, Christ Jesus, he, notwithstanding all evil winds of human doctrine, and heavy showers of tyrannical and severe persecution, remained immovable and steadfast unto the end; wherefore, when the chief Shepherd shall appear in the clouds of heaven and gather together His elect from all the ends of the earth, he shall also through grace hear the words, “Well done, good and faithful servant; thou hast been faithful over a few things, I will make thee ruler over many things; enter thou into the joy of thy Lord.” I Pet. 5:4; Matt. 24:31; 25:23. 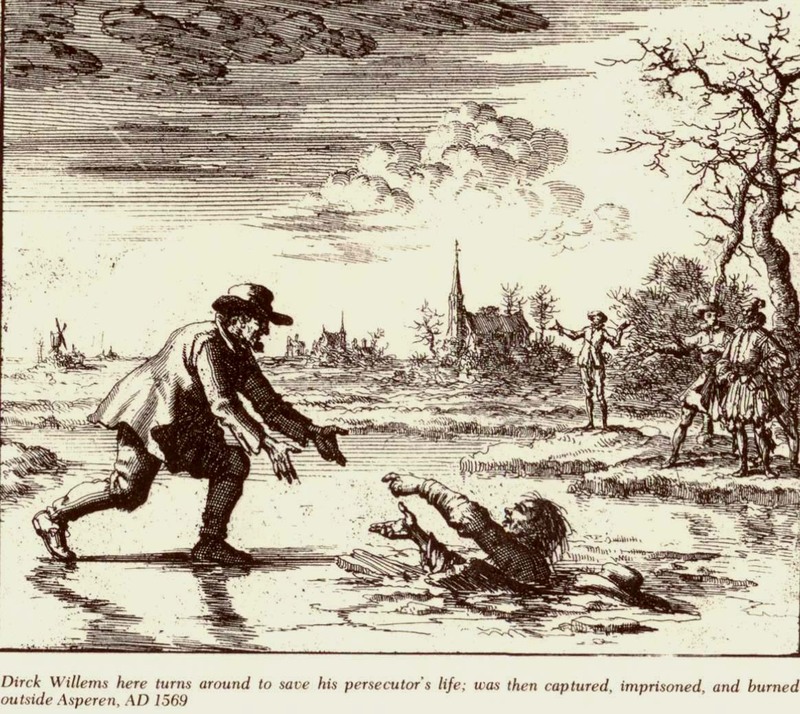 Concerning his apprehension, it is stated by trustworthy persons, that when he fled he was hotly pursued by a thief-catcher, and as there had been some frost, said Dirk Willems ran before over the ice, getting across with considerable peril. The thief-catcher following him broke through, when Dirk Willems, perceiving that the former was in danger of his life, quickly returned and aided him in getting out, and thus saved his life. The thief-catcher wanted to let him go, but the burgomaster, very sternly called to him to consider his oath, and thus he was again seized by the thief-catcher, and, at said place, after severe imprisonment and great trials proceeding from the deceitful papists, put to death at a lingering fire by these bloodthirsty, ravening wolves, enduring it with great steadfastness, and confirming the genuine faith of the truth with his death and blood, as an instructive example to all pious Christians of this time, and to the everlasting disgrace of the tyrannous papists. NOTE: In this connection, it is related as true from the trustworthy memoirs of those who were present at the death of this pious witness of Jesus Christ, that the place where this offering occurred was without Asperen, on the side of Leerdam, and that, a strong east wind blowing that day, the kindled fire was much driven away from the upper part of his body, as he stood at the stake; in consequence of which this good man suffered a lingering death, insomuch that in the town of Leerdam, towards which the wind was blowing, he was heard to exclaim over seventy times, “O my Lord; my God,” etc., for which cause the judge or bailiff, who was present on horseback, filled with sorrow and regret at the man’s sufferings, wheeled about his horse, turning his back toward the place of execution, and said to the executioner, “Dispatch the man with a quick death.” But how or in what manner the executioner then dealt with this pious witness of Jesus, I have not been able to learn, except only, that his life was consumed by the fire, and that he passed through the conflict with great steadfastness, having commended his soul into the hands of God. As we have come into possession of the sentence which these rulers of darkness passed upon this friend of God, we have deemed it well, to add it here for the benefit of the readers, in order that reading the same, they may be able to perceive the truth of this matter. COPY: Whereas, Dirk Willems, born at Asperen, at present a prisoner, has, without torture and iron bonds (or otherwise) before the bailiff and us judges, confessed, that at the age of fifteen, eighteen or twenty years, he was rebaptized in Rotterdam, at the house of one Pieter Willems, and that he, further, in Asperen, at his house, at divers hours, harbored and admitted secret conventicles and prohibited doctrines, and that he also has permitted several persons to be rebaptized in his aforesaid house; all of which is contrary to our holy Christian faith, and to the decrees of his royal majesty, and ought not to be tolerated, but severely punished, for an example to others; therefore, we the aforesaid judges, having, with mature deliberation of council, examined and considered all that was to be considered in this matter, have condemned and do condemn by these presents in the name; and in the behalf, of his royal majesty, as Count of Holland, the aforesaid Dirk Willems, prisoner, persisting obstinately in his opinion, that he shall be executed with fire, until death ensues; and declare all his property confiscated, for the benefit of his royal majesty. So done this 16th of May, in presence of the judges: Cornelis Goverts, Jan van Stege Jans, Adriaen Gerritts, Adriaen Jans, Lucas Rutgers, Jan Jans, and Jan Roefelofs, A. D., 1569. Extracted from the records of the town of Asperen, and after collation this copy was found to agree [with the original], the 15th of October 1606. Acknowledged by me, the town clerk of Asperen. One could fill a library with the books that have been written about the first two baptisms. In the life of Jesus, our Perfect Example, we find Him being baptized with water by John the Baptist. In quick succession, the Holy Spirit “descend[ed] like a dove, and light[ed] upon him.” It is easy to see two baptisms here; one with water, and the other with the Holy Ghost. It would seem that a person who is looking for people to follow him would offer his devotees something better than a lifetime of suffering. How many political candidates would get elected if in his campaign speeches he said, “Hey, vote for me and I promise you that I will lead you into the biggest economic depression this country has seen yet!” Yet, Jesus—the Jesus of the Bible—essentially tells His followers something very close to that. “Follow Me,” He told them. And then He voluntarily allowed Himself to be martyred without the least resistance—and He could have called 10,000 angels if He wanted to! One of the big causes of unbelief that people stumble over concerning the God of the Bible is the question as to how a “good God” can allow evil to happen. How can a supposedly omnipotent [All-powerful] God allow suffering and evil to continue in the world? How could He, who is stronger than Satan, have allowed him to continue for so long? How can it be that a good God allows innocent children to starve? Those are valid questions, ones that I don’t claim to be able to give a complete answer to, other than two points: 1. Man’s choice to sin is the cause of evil in the world, and God allows humanity a free choice. The freedom for a man to choose unrighteousness will affect others around them. Although God sometimes does limit a man from harming others, He does not totally stop sin and its consequences from happening. 2. Suffering is necessary in this world so that the righteous character of God can be made manifest. We will examine the second point in this article. When Adam chose to disobey God, God was forced to separate from Adam. Adam and his posterity were then left to the whims of their own mind and the temptations of their flesh and those of Satan. By nature—without God’s Spirit within to guide and empower—humans will choose that which serves to bring them the most pleasure. This is the opposite of God’s nature, which is love, the opposite of self-centeredness. Thus man’s fallen state left his character opposed to God’s character. Self and love cannot be mixed, just like oil and water do not mix. When man began to follow his own ways, it was anarchy. In anarchy, every man does that which he thinks best, and this usually translates into doing what brings him the most personal gain and pleasure. So if Bob has 100 acres, but he sees Joe has 200 acres and better cows, Bob plans a midnight raid and kills Joe and takes over his land and cows. Man without God will basically act like an animal, as Ecclesiastes 3:18 tells us: “I said in mine heart concerning the estate of the sons of men, that God might manifest them, and that they might see that they themselves are beasts.” So just like a wild animal will fight for its survival, killing one of its own over who gets to eat the prey, man fights and kills and strives for the mastery over his fellow man. Humanity without God will be unrighteous. As their morals and integrity degrade (which is the natural course for people without God), humans will cheat and hurt and deceive even those who try to help them. Think of those men who will cheat old grandmothers out of their bank accounts and houses, even though the old lady is very kind to them. This is total unrighteousness: returning evil for good. To limit this unrighteousness and help humanity from slipping into total degeneracy, God instituted human governments. These usually form some sort of basic guidelines to help limit the worst forms of unrighteousness, with applicable punishments for those who break the guidelines. The Law of Moses was one of these governments, albeit a special law that also had many types and shadows of the Gospel built into it. These laws did not restore humanity to the fullness of God’s nature and character, but they did try to put a harness on the worst of man’s unrighteous actions. Most governments recognize that murder, stealing, and cheating are wrong and make laws to limit these evils. Basically, instead of evil for good, civil laws say evil for evil and good for good. This means that Bob should not kill Joe for his land and his cows, but if Bob does break the moral code and attack Joe, Joe is allowed to return the evil and defend himself. Most of the civil governments of this world operate on this basis, more or less. Under the threat of punishment, most men can live up to the “evil for evil” standard of righteousness. And of course, it is not hard to return good for good. If Bob invites Joe for a barbecue, Joe may well invite him for some watermelon on a hot day. Then came the kingdom of God. Jesus began the Gospel message by laying out the righteousness upon which His kingdom would operate. Of course, it would not be unrighteousness: evil for good. But, neither would it be evil for evil, good for good. It was to be a radically new kingdom. Actually, it was simply a return to God’s original intent for man in the Garden of Eden. Christ’s kingdom would be a kingdom based upon the heavenly concept of good for evil! Now, when Joe hears the rumor that Bob is about to attack him and take his land and cows, Joe visits Bob and blesses him. Total unrighteousness: evil for good. Righteousness by civil law, or human righteousness: evil for evil, good for good. The righteousness of God: good for evil. Let’s look at a few issues in the light of these three levels of righteousness, starting with war. In total unrighteousness, one nation can attack another for whatever reason. In human righteousness, war is often limited to what may be called “just war”: if one nation does attack another, then the attacked people have a right to fight back. In God’s righteousness, when a people are attacked, they do not fight back, but even bless the attackers. In boundary disputes, total unrighteousness may flare into a shootout if the two parties involved get into an argument. When one side has killed the other, “to the victor go the spoils.” In human righteousness, boundary disputes are taken before a judge, who tries to hear both sides and make a just decision. In the kingdom of God, if one side tries to move the boundary marker illegitimately, the other lets him do so without a fight, and may even tell the offender to take double. What place does a baptism of suffering have in the kingdom of God? The answer is that suffering is the only way in which the righteousness of God can be manifested. 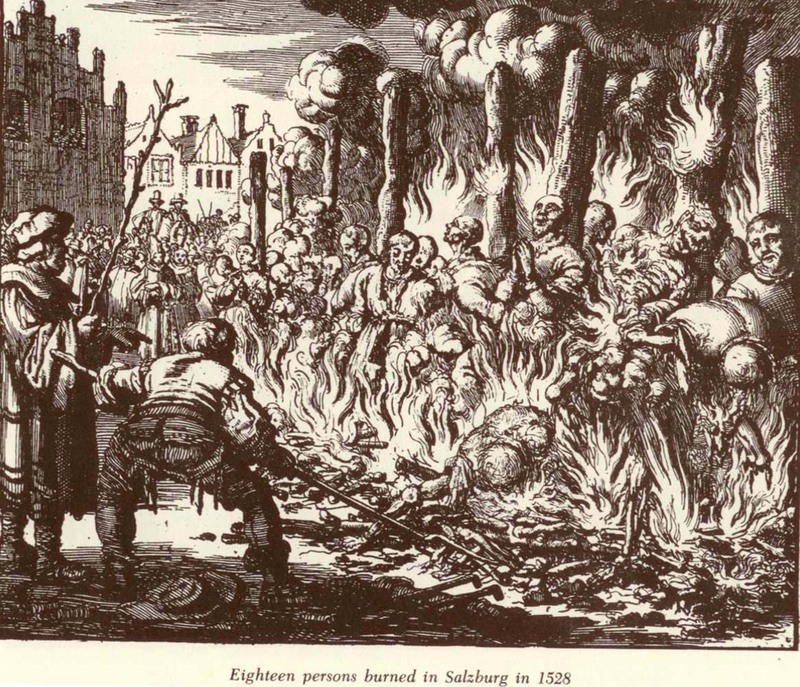 One early Anabaptist writer even put it this way: “A man can only be made righteous through suffering.” If you are like me, that little sentence will make you shake your head on the first time reading it. But after contemplation as to what he meant, I began to concur. Let me explain. The righteousness that the scribes and Pharisees measured themselves with was the Mosaic law. And this law did hold men accountable to a measure of righteousness that was better than total unrighteousness. Poking out a man’s eye for no reason was prohibited. But if someone poked out your eye, you had a right to poke his out: eye for eye. “Evil for evil” was okay in Moses’ law, but “evil for good” was outlawed. Jesus told His followers that if they were going to enter into and live in His kingdom, they had to move beyond the “evil for evil” level of righteousness. Jesus did not leave His disciples in the dark as to some practical applications. He took them through several points of the Mosaic law and lifted the standard up to the righteous character of God, and how that would work out in practical terms. His disciples were a bit taken aback. At one point, they exclaimed, “If the case of the man be so with his wife, it is not good to marry.” It seems they questioned, like many people do, whether it would be possible to live up to the new standard. Obviously, we would all prefer to live in a world in which there was no unrighteousness. But when we ponder this whole point, suddenly we see the “need” for evil. If all were good, there would never be the opportunity to manifest the character of our good God in its fullness. Only when the true righteousness of God confronts evil, and overcomes it by good, can God’s glory shine its brightest. One cannot suffer triumphantly if he never suffers! Thus God came into this world through His Son Jesus to suffer, to triumph over evil by returning good to those who abused Him. His name was glorified through it all. The Lion of the tribe of Judah prevailed over evil, and His blood was taken from Him and sprinkled in the inner sanctuary [spirit] of dead humanity to enliven, purify, and forgive. Whosoever would look upon the victorious Son on the tree could be quickened into a new life of righteousness, by the Holy Spirit. But the Messiah still suffers today … in His body. And He still overcomes today … in His body. He is still going through the third baptism, yet today … in His body. His people are still being “baptized” with unrighteous deeds against them, so that the righteousness of God can manifest itself in every generation. Persecutions, banishments, lawsuits, divorces, angry words, abuse, and cursings are still heaped upon the saints. Yes, it still pleases God to “bruise” His people with suffering, because He knows that the beautiful aroma of His righteous character—which He planted in them—will arise from the situation. Just like a crushed flower gives off a greater aroma, so God’s people produce more righteousness when they are “crushed” in suffering. God is not a sadist. He does not enjoy watching people suffer because He enjoys watching twisted faces, looks of despair, and hearing screams of pains. But it is only when we suffer that we can return good for evil. If we never pass through evil circumstances, we could never respond righteously to evil circumstances. Thus it remains the lot of God’s people to suffer. The first letter of Peter is filled with the idea of suffering, and how suffering fits into the Christian life. Although we will not look at all of that letter now, notice one phrase in 1 Peter 3:14: “But and if ye suffer for righteousness’ sake, happy are ye.” While I would not insist that the following is what Peter meant, let us consider what may be a new way of looking at this sentence. We probably tend to think that Peter is saying that “If you did what was right and got blasted for it, rejoice.” That is certainly true, and may be what Peter intended. But let’s suppose that Peter means, “If God sends you into a situation where you suffer terrible, unjust treatment—just so God can have you respond with “good for evil” righteousness—rejoice!” In other words, God may allow one of your employees to embezzle $50,000 from your business, just so that the world can see you respond like Christ would in the situation. God is “bruising” you to get a sweet odor! And we are supposed to rejoice at the opportunity! Our flesh usually has no problem accepting baptism with water or with the Holy Ghost. But it screams in defiance at the third baptism: the baptism of a bloody suffering. There are no little boxes to check off in the “contract” of the New Covenant, that is, a little box that says, “Check here if you would like to opt out of any of the following baptisms.” Entrance into the kingdom is a total surrender of the will to whatever God has in store; we don’t “bargain” with God. Jesus told us we need to count the cost before following Him. He said that we must take up the cross and follow Him. No opt-outs. As we have already seen in this article, the only way that the righteousness of the kingdom of God can manifest itself is when evil happens. Evil must happen, or we cannot overcome it with good. So we must count the cost. If we don’t want to have any suffering in our lives … then don’t even think of becoming a disciple of Jesus! It is true; God may choose some of us to have less suffering, but if we want to conquer unrighteousness, unrighteousness has to happen to us. We cannot overcome bitterness unless we experience a situation that tempts us to hold a grudge. Being treated nicely doesn’t usually tempt us to bitterness, so we must needs experience treatment—a mistreatment—that isn’t so nice! When we think of glorifying God, we often think of singing praises or testifying of the great things God has done. While this is one way to glorify God, there is a better way. That way is to manifest God’s character in trying situations. Others looking on will see the righteous response and glorify the Father. Peter, preaching after Pentecost, told the crowd about the glory of the cross: “The God of Abraham, and of Isaac, and of Jacob, the God of our fathers, hath glorified his Son Jesus; whom ye delivered up, and denied him in the presence of Pilate, when he was determined to let him go.” The glorification of Jesus happened when He was unjustly crucified and responded with forgiveness. God will also glorify us, if we will accept the suffering in our life and respond righteously. Paul wrote that we are “joint-heirs with Christ; if so be that we suffer with him, that we may be also glorified together.” And in another place Paul expressed the great longing to know God. Not just know about Him, but to really know Him. And in that context, Paul speaks of the role of sufferings in his relationship with Christ, saying, “That I may know him, and the power of his resurrection, and the fellowship of his sufferings, being made conformable unto his death.” Fellowship with Christ consisted of cosuffering with Him. In his letter to Timothy, Paul states that “If we suffer, we shall also reign with him.” That simply means that if we will take Christ and His power with us into an unjust situation that we are put into, He will give us grace to return good for evil, thus conquering evil. If we let an evil circumstance move us to respond back with evil, evil has conquered us. But when we let Christ move us to respond to evil with good, we have conquered evil. In 1527, the Anabaptist Leonard Schiemer wrote a letter to the church at Rattenberg, saying, “It is true, Christ’s suffering destroys sin, but only if He suffers in man. For as the water does not quench my thirst unless I drink it, and as the bread does not drive away my hunger unless I eat it, even so Christ’s suffering does not prevent me from sinning until He suffers in me.” When Jesus suffered unrighteous treatment, He “ceased from sin” by not returning evil for evil. In the same way, we can “cease from sin” when we return good for the evil done to us. In this way, sin is destroyed and conquered … by the Christ living in us! One favorite analogy among the early Anabaptists was that of a tree in the woods. That tree is a house; but only a potential house. Only after the tree suffers the pain of the axe and saw, turning the tree into useful boards, is the tree really a house. And so it is with the Christian and righteousness. A child of God, birthed into a new life by a baptism of the Holy Ghost, is a fountain of righteous deeds—or like the tree in the woods, a potential fountain. It is only after the believer has been sawn and shaped by sufferings does his righteous character come to any fruitful use. In this analogy, we can now grasp how the one Anabaptist could write that we can only be made righteous through suffering. We are made righteous when God regenerates us, but that righteousness becomes tangible through our responses to unrighteous actions against us. I hope, dear lords, that you will not act rashly against me. I say this not from deceitful motives, but because I do not want you to incriminate yourselves by doing me violence. What good is it to you to reduce me to this miserable condition? I am distressed beyond misery, I am poverty-stricken and robbed of my ability to work, beyond what I could ever overcome in my lifetime [They had tortured him so severely he didn’t think he would ever heal enough to be able to work again.] I have been starved so that I cannot now eat or drink, and my body is broken. How would you like to live for five weeks with only boiled water and unflavored bread soup? I have been lying in the darkness on straw. All this would not be possible if God had not given me an equal measure of His love. I marvel that I have not become confused or insane. I would have frozen if God had not strengthened me, for you can well imagine how a little bit of hot water will warm one. In addition to this, I suffered great torture twice from the executioner, who has ruined my hands, unless the Lord heals them. I have had enough [torture] to last me the rest of my days. However, I know that God never forsakes me if I suffer for the sake of his word. I know full well that I have experienced with great pain the Enemy’s temptations against you. May God forgive you and all the dear people who have falsely accused me before you. Did you catch the righteousness of God manifesting itself? The returning of good for evil, the blessing for cursing? Mangled for life because of false accusations, yet forgiving … that is the righteousness of Christ coming out of suffering! That is the tree being sawn into boards to create a house. Such poignant accounts of suffering should strike us here in North America as to how little we suffer in our time. We think it is “suffering” if we leave our lights on at Walmart and have a dead battery when we get back out to our vehicle. Or, perhaps we rip our dress on the rose bush while we pass. Yet, I know that we all do suffer injustice in some degree. It is part and parcel of life on Earth, and it is a required part of being a disciple of Jesus. People mock us. People steal our goods. People cheat us. Friends turn their back on us. Although the Bible doesn’t clearly say so, I personally believe that God purposely lines Christians up to suffer some of these things, quite on purpose, just to manifest His glory. These are hard things to go through, but if we would just stop and consider the matter, it is the only way that we can clearly manifest the righteous character of God that He has given to us as a great, undeserved gift. And just like the tree needs some working to become useful, we must pass through suffering to produce the full righteousness of Christ. Perhaps it will help us to look upon our future sufferings not as “trials” (which they are), but as opportunities for God to overcome evil with good. When evil is overcome by good, then the kingdom of God has come to earth. Someday, all evil will be banished forever, and the kings of God’s kingdom (those who overcame evil) will be taken to a place where there will never be any more evil to conquer. What a day that will be! May the grace of God take you through your third baptism! A crown awaits those who overcome! Walter Klassen, ed., Anabaptism in Outline, ((Kitchener, Ont, Scottdale, Pa): Herald Press, 1981), 90-91. George Huntston Williams and Angel M. Mergal, eds., Spiritual and Anabaptist Writers, Ichthus, ((Philadelphia, PA): Westminster, 1957), 80. Originally published in The Heartbeat of the Remnant (March/April 2011), 400 W. Main Street Ste. 1, Ephrata, PA 17522.